The classic game of Backgammon may have been around since 3000 BC when a similar set was uncovered from that era. A traditional Backgammon set consists of a board or case, two dice, two sets of fifteen checker style pieces of differing colours (usually black and white or red and black), a doubling cube and dice thrower. Each game is played by two players and almost any age can grasp the basic rules from around a five year old upwards. 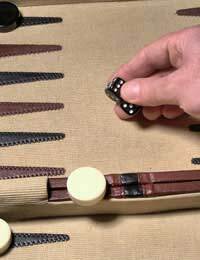 To begin a game of Backgammon, players each throw a single die with the highest throw going first (if both players roll the same number they simply roll again). The objective in a game of Backgammon is simply to get all of you own checkers to your side of the board and then remove them. The winner of the game is the first player to have removed all their own checkers. In backgammon this removal of pieces is termed ‘bearing-off’, though we’ll use removal for ease. Both players move in opposing directions on the board in a sort of ‘U’ shape, from one side to the other. How far you can move is dictated by what you roll on the dice, each dice dictating the move of one of the player’s pieces or both together dictating the move of one. For example the roll of a 3 and 4 would allow the player to move two different checkers, one at 3 and one at 4. Or the player may opt to move one checker the sum total of 7 spaces. Checkers can only be moved to a vacant space. A vacant space in backgammon is a space that is free, has your own checkers on it or no more than one of the opposing players checkers. Rolling doubles in Backgammon means the player has numerous choices and also gets to use the roll twice. The player can decide what to move and how many spaces. For example a player rolling a double 3 can move two checkers 6 spaces each, one checker 12 spaces and so on. It is generally thought the player that rolls the most doubles will win the game as it opens up more options to them. If you’re playing a single game of Backgammon, the easiest way to work out the winner is by whoever manages to remove all their own checkers first. If at least one checker has been removed by the opponent, the winner is entitled to at least one point if the cube hasn’t been used. If the cube has been used, then the winner is entitled to the number of points at stake according to the cube. If you are playing a double game known as a ‘gammon’, if the loser hasn’t managed to remove even one checker, the winner gets double the amount determined by the cube. If playing for three rounds (officially known as backgammon) and the losing player hasn’t managed to get all of their checkers removed from the winners home board, then the winner gets three times the number of points determined by the cube. There are many Backgammon variations in existence, but some of the most popular are Acey Deucy, Narde and Tabula. Acey Deucy is a variant where the player can move any checker they wish at any time, even if they don’t have another checker to bring in. Also, if the player rolls 1–2 (acey deucy) then they must first play acey deucy and then play any number they want four times. The player then gets an extra roll and if they roll 1-2 again, they can start the sequence over again. Narde is a popular variation of Backgammon that is played in Russia. Players start off with 15 checkers and both move in the same direction around the board. There is no hitting in Narde and doubles aren’t classed as special rolls. The most important aspect of Narde is not to get blocked in and to remove all your checkers. Tabula is perhaps the oldest known variation on Backgammon. In Tabula, both players start with their checkers off the board and begin at the same place and work their way along the board in the same direction. The aim is to remove all your checkers as in normal Backgammon and many of the other rules are also the same. In backgammon there are numerous helpful tips and strategies to hopefully carry you towards a win. Some of the most basic are the introduction of the doubling cube. Many players are scared of doubling up in case they lose, but you must consider the benefits of doubling at any point in the game where it may come into play. Also, remember that you can redouble throughout the game. If your opponent doubles you to two, you can double to four. When you become a more advanced player, always have a plan. It may change as each roll is played, but by planning ahead, you have the chance to save the gammon. If you're considering doubling, always think of the options your opponent has in the same situation. Yes you're putting yourself at risk for a take, but if you're truly confident in your doubling, you will be fine. Also of course, try to plan at least two alternatives to your move. Then you can see what your opponent is likely to do.